An expert in population health and former analyst at the World Health Organization has been named to a $1 million health research chair in diabetes at the University of New Brunswick. 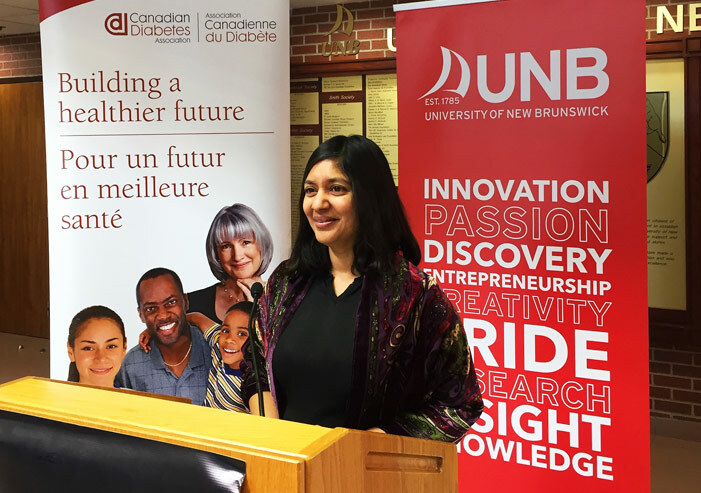 Dr. Neeru Gupta becomes the first person to hold the Canadian Diabetes Association-New Brunswick Health Research Foundation Chair in Diabetes Research. She previously worked to improve public health systems, researching the effects of chronic illness such as diabetes on society, and helping to inform evidence-based public health policy both locally and internationally. In November 2015, the Canadian Diabetes Association and the New Brunswick Health Research Foundation announced they were contributing $1 million to the creation of this chair. In addition to hosting the chair, UNB committed to establishing a tenure-track position for the researcher. Dr. Gupta is now also an associate professor of sociology at UNB. Dr. Bruno Battistini, president, CEO and scientific director of New Brunswick Health Research Foundation, says this work stands to make a difference in the fight against diabetes. “We now have access to big data and we can connect past observations, the current situation and project and plan for the future. This chair will cross-analyze the biomedical and social determinants of health that lead to diabetes using available administrative datasets to enable best practices,” says Dr. Battistini. Dr. David Burns, vice-president (research) at UNB, is pleased to be welcoming Dr. Gupta to UNB. Dr. Gupta has held a number of positions in demographics and health care over her career, including two stints with the World Health Organization in Geneva, Switzerland. At the WHO, she worked to improve public health systems through the generation and sharing of research and best practices and encouraging evidence-based approaches to health policy and planning. She has also served as a lecturer-researcher at her alma mater, the Université de Montréal, a consultant in population health and development to international agencies, and as a senior epidemiologist focused on trends in chronic illness, including diabetes.